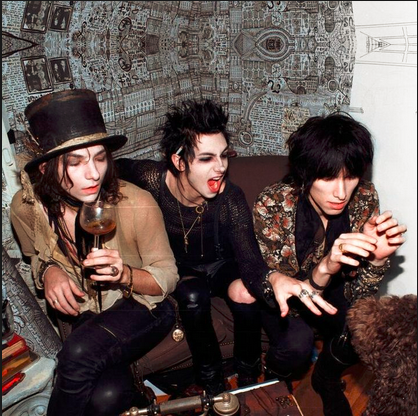 I’m having entirely too much fun looking up videos and images of the band Palaye Royale. 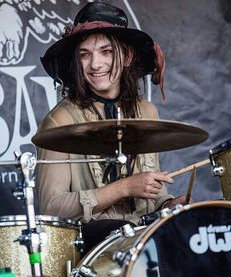 Drummer Emerson, the prominent pen and ink artist among the brothers, has become one of my writing muses. There is nothing like seeing someone doing what he or she enjoys. Rock on, Emerson! He is just way too cool. 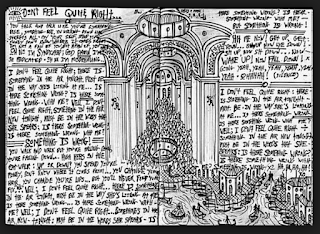 Check out this below from a lyrics book. 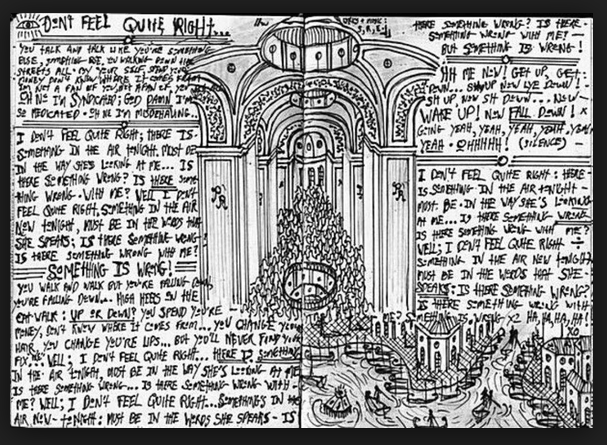 He also doodles this amazing art on walls. Mom would have approved of the hats. ~grin~ But he even looks adorable with 'bed head'. Guess I have a new obsession, huh? The band Palaye Royale has me so hooked that I listen to ‘Boom Boom Room (Side A)’ every single day now and yesterday joined their street team promotional Facebook group known as the Royal Council. Since I already shared their (awesome) official video for 'Mr. Doctor Man', I’ve provided links to one of their fun little promotional clips and an impromptu acoustic performance below. For those of you who cannot watch videos due to a lack of time, your employer’s permission, data capacity (sorry, my cynical sailor’s sidekick ~hugs~), or what have you, let me tell you a little about the boys. Emerson, Remington, and Sebastion are three brothers born in Canada and raised in Las Vegas, Nevada USA. 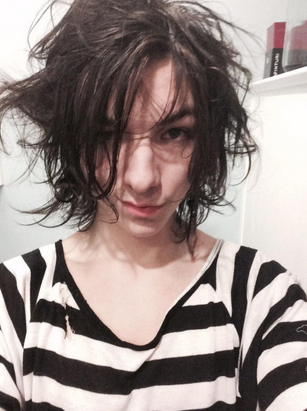 Palaye Royale is pronounced 'pal-ay roy-al'. They took that name from the dance hall in Toronto where their grandparents met. Their album’s sound has classic rock influences with a punk sensibility and (I think) a hint of rockabilly. The ‘Side A’ in the title comes from the fact the brothers first intended to release thirty songs, believe it or not. Lucky for us, ‘Side B’ should be out by year’s end. Not only is their music great, their fashion sense is awesome. 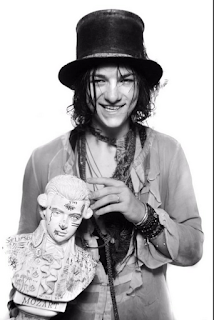 And I have to say that Remington’s smoky voice really shines in the acoustic version of ‘Ma Chérie’. Now I just need to convince their tour manager to book a gig or two at Cincinnati Ohio’s 20th Century Theater. Built in 1941, the building’s Neoclassical Moderne architecture was made for their fashion-art rock style. The venue’s fabulous sound and intimate space are amazing, too. Do you think I can convince them to play a four hundred person capacity theater? I mean, heck, if they'll play in an equipment trailer, why not? A friend sent me a video featuring rescued ducks, which got me to thinking about colorful North American phrases that feature those amazing fowl. They include my title, 'feeling ducky', which means a person is in good spirits. While I don’t know the derivation or origin, I cannot picture an angry duck except in cartoon form. And Daffy sure can pull a snit! ~grin~ Seriously, do a search on ‘Daffy Duck angry’. 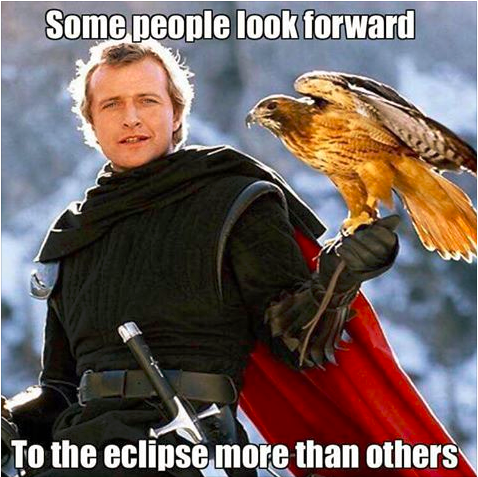 It’s a hoot. That boy needs to relax. There’s another phrase I heard in childhood that indicates a person tackled a task or skill with ease – 'like a duck taking to water'. Or when someone doesn’t allow a bad situation or insult (et al.) to bother them they let it go 'like water off a duck’s back'. If you want to watch the (quite short) video, I will warn you that the music gets a bit tedious. But the footage is amazing. Do you know of any other phrases that feature ducks? I imagine the fabulous birds get prominent mention in many languages. I am a recent media socialite (is that a phrase?) and signed up for Instagram a few weeks ago. Nikki Sixx of Mötley Crüe fame is one of the artists I follow. The bass player and lyricist extraordinaire never stagnates, always looking for the next artistic outlet. He also stays alert for musicians to promote. And I am extremely grateful to him for introducing me to the group Palaye Royale. A little lighter than my usual listen of late, the album ‘Boom Boom Room’ is playing as I type and I’m liking the sound. A lot. I should see them live, shouldn’t I? 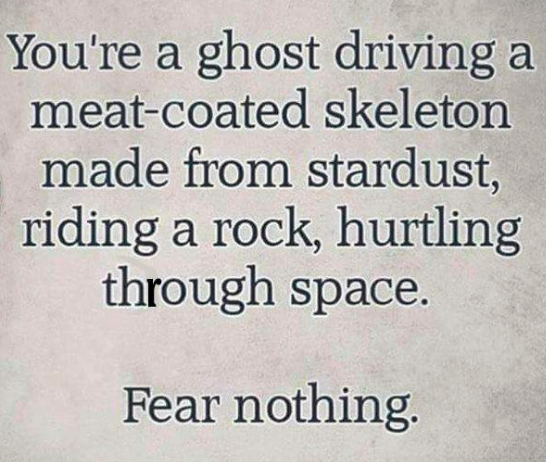 A Facebook friend of mine, whom I’ve known for years through a fanfiction website, shared a post from a group called Cheerful Nihilism. Enjoying the black humor I couldn’t help noting a typo. ‘Though’ should have been ‘through’. Bless Amanda’s heart, she ‘corrected’ it for me. And she remarked that reading friends’ stories checking for errors makes it hard not to notice them. I had to smile even wider. Does this make you feel better or worse? Our neighbor owns his own flooring business. So my partner, out of the blue, decided to contract him to replace our aged linoleum in the foyer. The evening before we emptied the closet. And Jezebel made the most of it. Which do you prefer, carpet or hard floors? 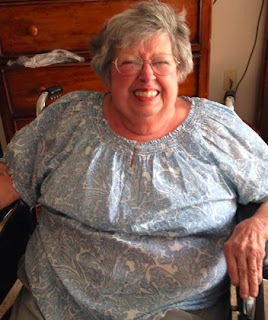 Somehow, I volunteered to say a few words at my mother's upcoming memorial service. It remains to be seen if I can get through the roughly minute and a half long speech, but here's what I wrote Saturday afternoon. Comedian Christopher Titus once said, “Mothers give you knowledge. Fathers make you earn it.” Well, I don’t know about that because my father still offers good advice. But there are many things Mom specifically passed along, either by word or deed. One. You’re never too old for crayons. Two. Hats are cool no matter what anybody says. Three. If you can’t remember your new friend’s name, ask her to spell it. 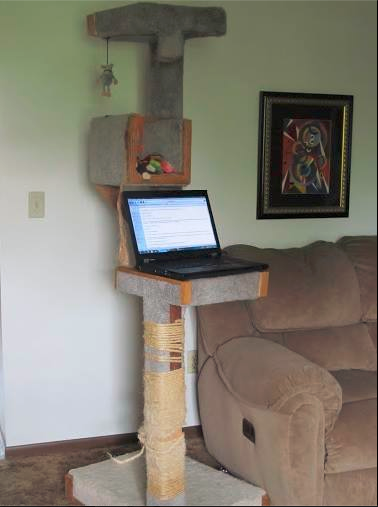 Of course, that only works if it’s unusual. But to this day I remember my friend Lanita, wherever she may be. Four. Hair accessories never go out of style. Five. Christmas tree tinsel is a seasonal hair accessory. And something I never thought about until a cherished friend brought it up is that Mom played music with her whole heart. She didn’t let the occasional slip up derail her joy. So don’t worry about being a perfectionist. 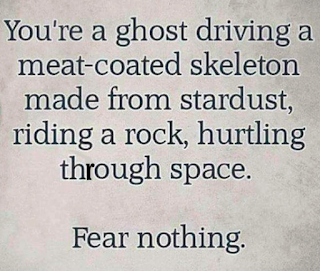 Well, unless it’s a Buehler's Kitchen Corner pizza for the display case or a church salad luncheon sign. Last but not least, I’d like to share my favorite scripture, which I’ll paraphrase. It sums up two of the most important things both Mom and Dad instilled, even if I’m not always a good example of them. My mother was extremely honest, and she was ever generous. Thanks, Mom. My modern life is a bit archaic. I don’t carry a smart phone. Our only television is an ancient, ridiculously heavy flat screen. And until we upgrade to a high definition TV, we don’t subscribe to Netflix. We still rent DVD’s out of the Redbox, in fact. Our last two rentals were the John Wick movies. I enjoyed them. The fact Keanu Reeves isn’t a spoiled jerk of a celebrity doesn’t hurt any. Last night we watched ‘Chapter Two’. From the start we enjoyed little inside jokes from the first film. One is brief mention of a fight scene we never see in either flick, sort of folklore among Russian mobsters. The allegation is that John Wick once killed three men in a bar using a pencil. We had to stop the movie. 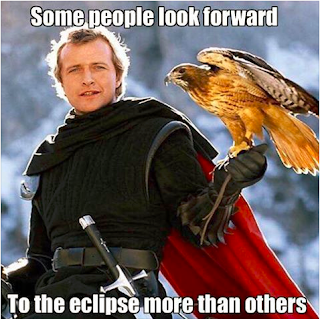 It took several minutes for me to stop laughing. Here are some little known facts about the film if you’re interested. I sure hope future plans pan out. Have you seen the John Wick films? Yesterday my partner told my father in a text message that I sleep in like a teenager. Sleeping until 7:30 or even 8 am doesn’t seem that bad to me, especially compared to my late teenaged habits. At first intending to defend myself, I decided not to waste the time. After all, I had better things to do. That’s when it hit me. I don’t act like a teenager. I’m acting like a writer. I spend nearly every waking moment possible at the keyboard either polishing a tale or storytelling anew. How many folks forget to eat on a semi regular basis until nauseating hunger strikes? Anyway, I would say that easily a third of my overall sustenance is devoured out of a sandwich bag so dining doesn’t impinge upon writing time more than necessary. Just yesterday I gulped a piece of fruit out of a bag while standing in the kitchen so as not to waste precious seconds cutting my peach into a bowl. The same can be said for those microwaveable burritos that hooked me for a while. As for those in my family who do rise at 5am (for no good reason, I might add), it’s guaranteed not a single soul stayed up the night before until two o’clock trying to get one more paragraph perfected before succumbing to exhaustion. My partner will admit to seldom spending more than five minutes reading an online article. Of course videos are a different story. In fact I’m hearing a string of them play in the next room while I type. Meanwhile, I’ve often polished a ten thousand plus word short story in one sleepless stretch. What pleasant obsession is occupying your August? It’s obvious to the most casual acquaintance that I like music, and my tastes gravitate toward rock and roll. Heck, I was raised on it alongside a sprinkling of Dad’s preferred Johnny Cash or The Oak Ridge Boys, some of Mom’s golden oldies thrown in for good measure. Hearing The Man in Black covering a Nine Inch Nails tune still makes me delirious with joy. Disco, on the other hand, curdles my blood. Always has. I don’t denigrate the talent of its performers, but please do not make me listen. When my favorite podcasters Josh Clark and Chuck Bryant covered the topic on Stuff You Should Know I struggled a little not to shut it off when they sampled the music. And my eyes glazed over hearing the litany of mostly unfamiliar artists’ names (not a good thing when you’re driving, I might add). I did learn some interesting facts, of course, about the history and whatnot. For example, during that era the number of disparate artists across vastly different genres trying their hand at the campy style blew my mind. Really, Dolly? How could you? My favorite part was learning about the so-called death of disco in Chicago, Illinois. I was ten years old at the time and never heard a peep. You can bet I would have cheered at that tender age had I known. However, flinging vinyl at peoples’ heads and tearing up a baseball field were egregious acts. You can watch the clip if you’re interested. It’s not terribly long and quite fascinating. Had you heard about this raucous event in 1979? Would you have attended? Let me start by saying that my book allowance has dropped considerably in the wake of blessed early retirement. 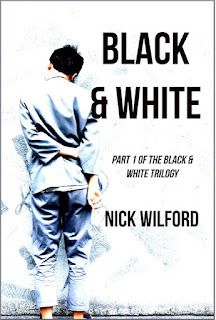 So imagine my delight when author and fellow blogger Nick Wilford offered followers an advanced read copy of his book ‘Black and White’, the first in his YA trilogy. I first found the writer/editor and his story through the April A to Z Blogging Challenge. Every day’s entry introduced readers to either characters or aspects of the ‘Black and White’ universe. I found it all quite intriguing. And the book itself did not disappoint. I wanted more, but that’s a good sign for a series. As a youth I would have found Nick’s world provided welcome escapism. This adult found the book’s editing impeccable, one of the finest examples I can point to these days (good promotion for his freelance editing services, if you ask me!). Even having a good notion of the plot beforehand I found myself surprised by some of its aspects. Help and hindrance to the main characters did not always come from the expected directions. I enjoyed getting to know Wellesbury Noon and Ezmerrelda Dontible (great names, no? ), too. At $1.99 (US), ‘Black & White’ is a bargain. You can pre-order on Amazon here (for the United States) and here (in the UK). I hope you’ll give this new twist on dystopia a chance. Be sure to check back next month for Nick Wilford’s guest post! So, what are you reading this summer? No, this isn’t about Monty Python, though I adore their comedy. This is all about the music, baby, another thing I geek over. Check out Avenged Sevenfold’s rhythm guitarist taking over vocals for a punk rock version of ‘Runaway’ with Warren Fitzgerald’s amazing contribution. I’m sharing this every which way I can imagine. Enjoy! Opening a story yesterday afternoon provided quite a surprise. For some reason, I noticed for the first time after several passes that the opening included a straight five hundred forty-two words of exposition. Whew! Not good. It certainly gave me a goal. And I’m pleased to say that before evening arrived the important bits became part of a much more interesting telephone conversation between the narrator and her father. That dialog already existed, just in a shorter format with less tension. They were disagreeing, after all. So the rewrite makes me feel better on many levels. Meanwhile, father and daughter are working things out. ~grin~ The widower dotes on her. I also made sure not to delete the original exposition, saving it in a different file. As fellow writers say (or lament) again and again, never toss out anything you've written. What little achievement made your weekend? Every now and then I find myself missing the refreshing taste of Zima. First marketed in 1994, the malt liquor held immense appeal to this Gen X gal. Production ended in 2008 yet I still recall the crisp citrus kick. 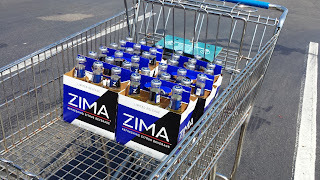 Imagine my surprise when a stroll into a local wine and beer vendor displayed a stack of Zima six packs standing just shy of my five foot two inch frame. My partner and I brought one home. The taste remained excellent. We treasured each bottle, limiting ourselves to one each per day. Today we tried to get more at a different store and learned they were cleaned out with no more expected. I picked up the phone and called the place we found it first. The gal told me they had a few six packs left. She laughed when I said we were on our way. 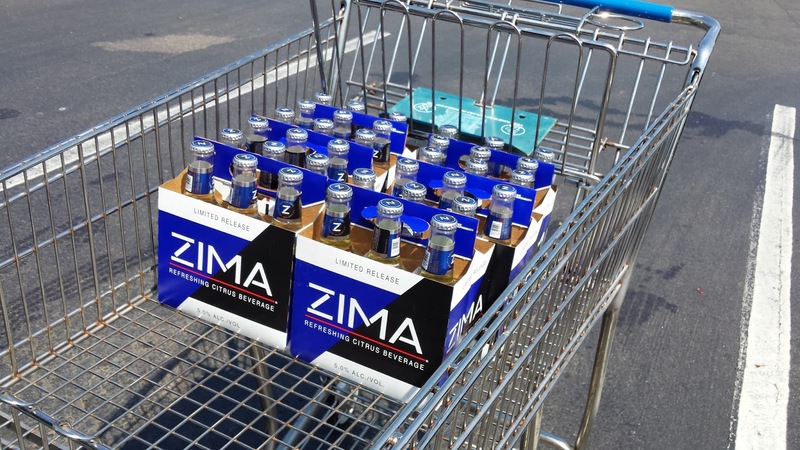 Did you ever drink Zima back in the day? It seems Mom sent me a comforting dream. ~grin~ It went back twenty-five years, our whole clan celebrating Christmas in the old house. I sat talking to my five-year-old nephew who now has a military career and four kids. His father (ever the clown) modeled a coat decorated to make him look like a Christmas tree (didn't happen but made my dream self laugh). My currently estranged brother and his now ex-wife arrived late on a wave of good cheer. All those hugs felt so real. Crazy stuff, but left me feeling good. So did Dad's email response to my obituary. He wrote, “Perfectly done, that's what writers are good at.” His certainty could not be more heartwarming. On a random fun note, via Instagram I learned another rocker celebrated a birthday yesterday. 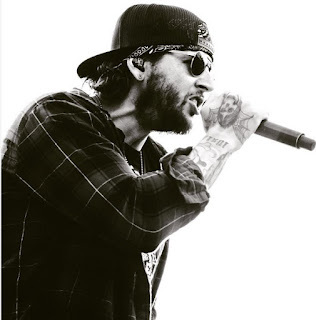 So Happy Belated Birthday to M. Shadows, lead singer of Avenged Sevenfold! I’m slowly dipping more toes into the social media pool. Do you have an Instagram account?